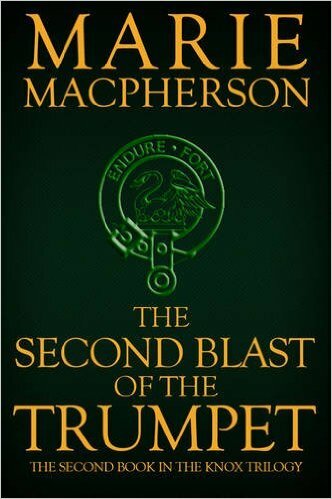 Book Corner: Marie MacPherson’s The Second Blast of the Trumpet – History… the interesting bits! Today over at the Review, you can read my take on Marie MacPherson’s biographical novel of John Knox and the Scottish Reformation, The Second Blast of the Trumpet. What a fabulous concept for a series of novels! The Second Blast of the Trumpet by Marie MacPherson is the second instalment in her series charting the life of the Scottish preacher – and father of the Scottish Reformation – John Knox. This book is, at the same time, entertaining, informative and thought-provoking. Fast-paced and superbly written, the novel gives us an insight into the life of the fiery Scottish preacher that few people would know about. Before reading this novel, the image I had of Knox was an angry, loud man who made Mary, Queen of Scots, cry and did not like women. He was, after all, the man who coined the phrase ‘the monstrous regiment of women’. Marie Macpherson brings Knox to life, putting flesh on his bones, so-to-speak, and introducing us to a complex man whose mission in life was to forge a path through the Reformation, and lead Scotland away from Rome. To read the full review of this fantastic novel – and to enter the prize draw and be in with a chance of winning one of two e-book copies in the giveaway, simply visit The Review and leave a comment. Good luck! thanks for the review Sharon and thanks, Georgina for reblogging! You’re welcome, Marie. Looking forward to Book 3.